American cops are waging a war against Black people. 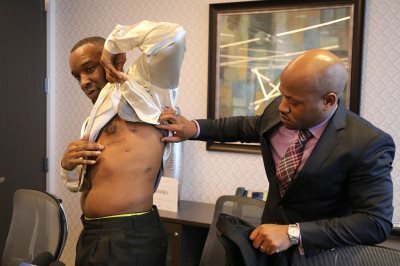 AFRICANGLOBE – A man shot fives times by Chicago police officers after he angered them by calling 911 sued the city for excessive force, claiming the officers weren’t disciplined until months after a police oversight board found his shooting unjustified. On Feb. 7, 2015, Antwon D. Golatte was stopped on the South Side by Chicago police for an alleged traffic violation. Three other police officers – Jaime Gaeta, Harry Matheos and Matt Dercola – soon arrived on the scene, court records show. Golatte, a Black man, says he called 911 as soon as he saw them, because he recognized the three as the officers who stopped him two days earlier. In that stop, the officers dumped his pizza on the ground and made him stand barefoot in the snow while they searched his car. Unhappy with Golatte’s call, the officers began swearing and pointing their guns at him, according to the complaint filed Friday in Chicago federal court. The officers then opened fire, shooting him five times and barely missing his vital organs, according to the lawsuit. Golatte says he still has bullet shards in his body that doctors were unable to remove. Golatte was charged with aggravated assault on the four police officers with a motor vehicle, charges he claims were trumped up to justify the shooting. Three days after the shooting, the Chicago Police Department updated its policy on use of deadly force, prohibiting officers from shooting at moving vehicles if no other weapons were being used against them. Golatte was acquitted of the accused crimes at trial. The Independent Police Review Authority also found in July that the officers used deadly force without justification. Nevertheless, “upon information and belief, the City of Chicago and Chicago Police Department failed to adequately investigate the shooting of plaintiff or impose any discipline on any of the defendant officers until December 2016, almost two years after the unlawful shooting,” the complaint claims. The Chicago Police Department has come under intense scrutiny since December 2015 when the release of police dashcam video showed the police execution of teenager Laquan McDonald by a white officer. The video sparked protests and the resignation of Superintendent Garry McCarthy. A Police Accountability Task Force created by Mayor Rahm Emanuel after the McDonald video went public found that the city’s Independent Police Review Authority, charged with investigating police misconduct, is only nominally independent and almost always finds in favor of the officers – although not in Golatte’s case. Forty percent of the complaints it received were not even investigated over the last five years. The investigation also found that, although Chicago’s population is evenly split between Blacks, whites and Hispanics, 74 percent of police shootings between 2008 and 2015 were targeted at Blacks, and Black drivers were four times as likely to be searched by police after being stopped, even though contraband was found twice as often on white drivers. Last month, the U.S. Justice Department released a scathing report finding that major problems with the police department’s training and accountability are to blame for civil rights violations and the erosion of public trust. The city and the Justice Department reached an agreement in principle to work together toward a consent decree that will addressing deficiencies found in the government’s investigation. Golatte is represented by Danielle A. Pinkston. He seeks punitive damages for claims of excessive force, malicious prosecution and conspiracy. The city did not immediately respond Monday to a request for comment.